Angry Birds Seasons by Rovio Entertainment is Apple’s free app of the week. The game’s iPhone version normally retails for $0.99 and the iPad version normally retails for $3.49. The game is free for this week only. Join the Angry Birds as they celebrate unique seasonal events from around the world. Enjoy the addictive physics-based gameplay you love, but with an exciting twist. 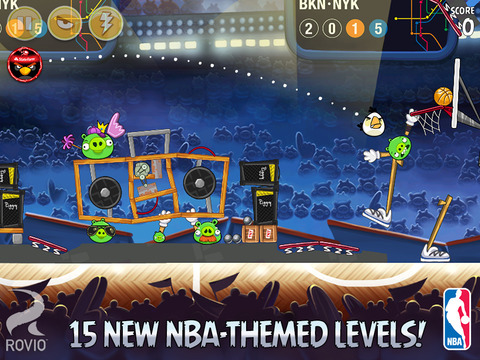 Rovio’s latest update to the app allows you to hit the court for the 2015 NBA All-Star Game. Angry Birds Seasons (iPhone, iPad) is available as a free download (normally $0.99 (iPhone) / $3.49 (iPad)) from the App Store. The game requires any iOS device running iOS 5 or later, and it has been optimized for the iPhone 5, 6, and 6 Plus. The game contains in-app purchases that range from $1.19 to $6.99.